Vents are stuck on defrost. From what I can find it would be the mode door actuator that would be a potential culprit. Is there a write up on R&R or pictures for this year so I can confirm the location? Any other areas that I should look at? No write-up needed. The mode door motor is pretty accessible. Just a couple of screws and a connecting link. While the motor is the most likely suspect, there is the possibility that the control panel is bad. So the air mix door motor switches from recirculated and fresh air correct? Any time I try and change that I hear this weird whining/grinding noise as well and it will just do it randomly as I'm driving not pressing any buttons...almost sounds like it is coming from behind the glove box. Will usually always do that sound when I change from fresh to recirc air. Could the whole CCM(climate control module) be going? Is that the SECU that you outlined? I also looked around at rockauto.com and can't anything to do with a mode control or air mix door motor - any other names these parts might be referenced by? The mode door motor switches the dash openings that the air comes out of. The air mix door motor is used to control the temperature of the air. The intake door motor switches between fresh air and recirculate. I don't know if you can find these motors at an auto parts store. Since it is so specialized, they are probably only available at a dealer. Ugh - thank you for the info. Being that this link says https://www.ebay.com/itm/2000-Nissan...frcectupt=true "blend door" I'm guessing that it is the air mix door for hot/cold right? I have been led to believe that blend door is a generic name for the air mix door. 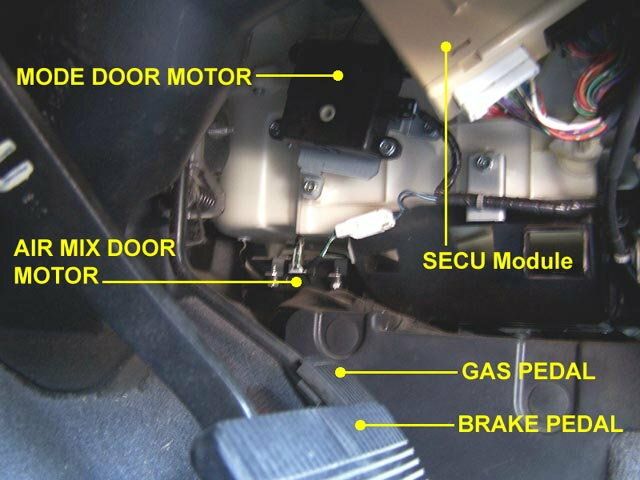 But when I go into the parts diagram and search for the part number in the one photo on ebay, 27731-1W200, it comes up as the mode door motor. This is the part you want. The price they are asking is a great price, the list price is $106.50. Last edited by DennisMik; 01-21-2019 at 09:56 AM. You are bomb - I bought it and will be getting the other part you outlined. Thank you so much! I found the air mix door motor - I had to remove it and then pull the panel behind it and it is in the upper right corner of that space. The part number on it shows 2W700 30820. I can't find that part ANYWHERE. What am I doing wrong pulling that part number off the unit? Weird thing too - I pulled off the mode door motor(back behind the radio as outlined in your pic) and left it plugged in, tested it and it worked fine, put it back on and screwed it down, and it worked fine. Not stuck in defrost anymore...wth? Just to be clear - the motor I removed from behind the glove box does change air from fresh to recirculated. Last edited by heuster; 01-28-2019 at 10:40 AM. When you take a number off of a part, it never seems to show up. This is true of many things that are assemblies. What I have convinced myself into believing is that those numbers are the individual pieces that make up the assembly. But I could be wrong. Back in post #8 I told you that the part number for the air mix door motor is 27742-2Y900 so your experience falls in line with my theory. So what is the status of your car? Is the HVAC system working ok now? I just got the new mode door motor today. Even the old one seems to be working now - just need to address the air mix motor intermittently working. Is there a good way to test the controller card as you mentioned it? (is that the SECU module in your picture or the ACCM?) Could that be causing the air mix motor to act up randomly? Sometimes when I press the air mix button, nothing happens, then all the sudden, I can hear it trying to move the door. Or the light on the button won't light up until it "feels like it" and then all the sudden I can hear it grinding away. The SECU and ACCM do not have any part in this. Those motors are driven by the control panel. It is possible for the control panel to be the problem, but the odds are it is the motor itself. The motor uses spring loaded fingers to make the connections internally since the pieces move. This allows for bad connections if the spring tension is lost as well as dirt and corrosion to interfere with the connections. The service manual does have a diagnostic procedure for seeing if it is the control panel or the motor. Does your car have to automatic controls or the manual controls? ac wont blow through vents. stuck on defrost. Clicking/Popping sounds from defrost vent area? ?